Pick up you from Chiangrai Airport and continue to Golden Triangle (lunch in between) , where the borders of Thailand, Myanmar and Laos convene. Enjoy sightseeing on boat trip on the Mekong River to Chiang Saen. Explore three countries view along the greater Maekong River, with possible to visit small village in Laos, return to Chiangrai and visit at Wat Rong Kun (White Temple), this magnificent place of worship was built only recently. It is the realization of a dream for Thailands noted artist, Mr Chalermchai Kositpipat, who designed and is supervising the construction of this beautiful white temple and its many statues of figures based on religious beliefs. In addition, there is a gallery nearby exhibiting his paintings. Check in at hotel then take leisure. Dinner on your own arrangement and may visit the Chiangrai Night Walking Street. Return to resort & overnight. After breakfast, proceed to Doitung, the 1389 meters high Doi Tung raises steeply, standing quite isolated close to the Thailand-Burma border. It is located in the area known as “Triangle”. The Doi Tung royal villa, former residence of the Late Princess mother (mother of the present king) Somdej Phra Srinagarindra is also located high up on the hill. Then visit The Mae Fah Luang Gardens are a botanical park located on the slopes below the royal villa. Flowers and plants grow among rock formations. After Lunch, take a long journey to Chiangmai with stop at Karen Village, the minority Hilltribe people who influenced from Burma. Enjoy observing their local way of life, traditional costume and their culture. Arrival Chiangmai in late afternoon then check in at hotel. After that is free at leisure. Dinner by your own arrangement and overnight at hotel. Optional: Kantoke Dinner. Enjoy a typical Thai dinner with ancient dances from northern Thailand, followed by a performance of dances and songs by various Hilltribe. After Breakfast, Pick up from Hotel and drive to Elephant Camp. Drive north of Chiang Mai to Mae Taman (At the elephant camp you will see the elephants taking their morning bath and demonstrating some of their skills. Afterwards take an elephant ride for approx. 1 hrs to a Lisu hill tribe village. The ride takes you through some of the lovely forest scenery and along the river. When we leave the elephants it’s just a short but exhilarating ride back to the camp on an ox cart where we will stop for lunch and refreshments. After lunch take a bamboo raft trip down the river, admire the scenery and absorb the tranquillity as you float down the river. Then drive back to Chiang Mai in the afternoon. Dinner by own arrangement and overnight at hotel. 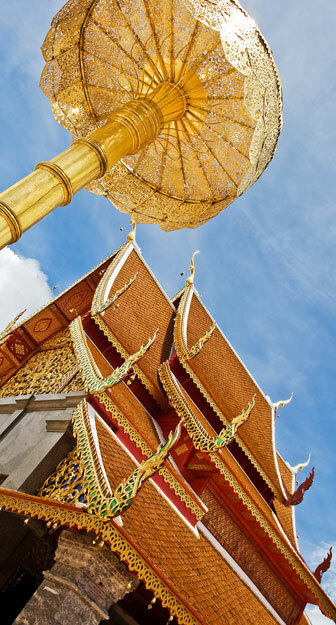 After breakfast, visit Wat Doi Suthep, tucked away in the mountains at an elevation of 1,056 meters. The temple is reached using a NAGA railing rising along both sides. The monastery was built by King Gue-Na in 1383. The center is a big Chedi (spiral pagoda), containing partial relics of Lord Buddha. After that, transfer you back to hotel or Chiangmai Airport for the next destination . Our package prices are inclusive of transfers and tours by air-conditioned car/minibus/coach with English speaking guide, baggage handling, entrance fees, meals as specified in the program , accommodation in air-conditioned room with shower/bath ( Twin Sharing) , service charges and VAT. Not included are other meals than mentioned in the program, surcharges for compulsory gala dinners, optional tours, expenditures of personal nature and domestic air ticket. Tour will end of service at Chiangmai So, domestic air ticket Chiang Mai-Bangkok is not included and have to book separate too.